What is the Legend of Oscar? The Legend of Oscar is a myth that dates back to the beginning of the Buddy Programme. There are a lot of different stories about what the myth exactly is, but we have exclusively found the answer hidden in an ancient archive at Studenterlaugets Office on the 4th floor. I am Oscar. I am the founder of the Buddy Programme at Studenterlauget. I am the greatest of all the Buddies, because I am the Great Helper of Students Travelling (a ‘GHOST’). As a GHOST, I secured that all of the Students Travelling (today they are called Newcomers) had an extraordinary start at this university. Therefore, I have started the Buddy Programme – so you all now can become a GHOST. They also call me ‘Oscar the Statuette’. Some say it’s because of the Academy Awards in Hollywood. But the truth is, that I am just a tall man with a very straight back and I like to have my arms crossed. And my name is coincidentally Oscar. Get over it. I hope you will participate in my programme. I hope you all will become a GHOST. I hope you will seek to give the Students Travelling the best start. And if you’re name is Oscar, then please don’t cross your arms and straighten your back… people will make fun of you. After a bit of research, we discovered that Oscar indeed did start the Buddy Programme after being the only one helping Students Travelling (Newcomers) back in 2005. After 2006, he disappeared (some say because of the teasing about the Academy Awards, but we will never know for sure). To honour the memory of the GHOST of all time, the amazing Legend of Oscar, we have in 2017 made a trophy called, the Legend of Oscar Trophy or GHOST Trophy. This Trophy will be held by the leading Buddy Team between events and will be given to the Buddy of the Year (GHOST) at the Christmas Dinner. Am I the new GHOST? You have the opportunity to become the Buddy Programme 2018’s GHOST. All you need to do is become a Buddy, and become the greatest of them all… easy peasy lemon squeezy, right? What is the Oscar Statuette? 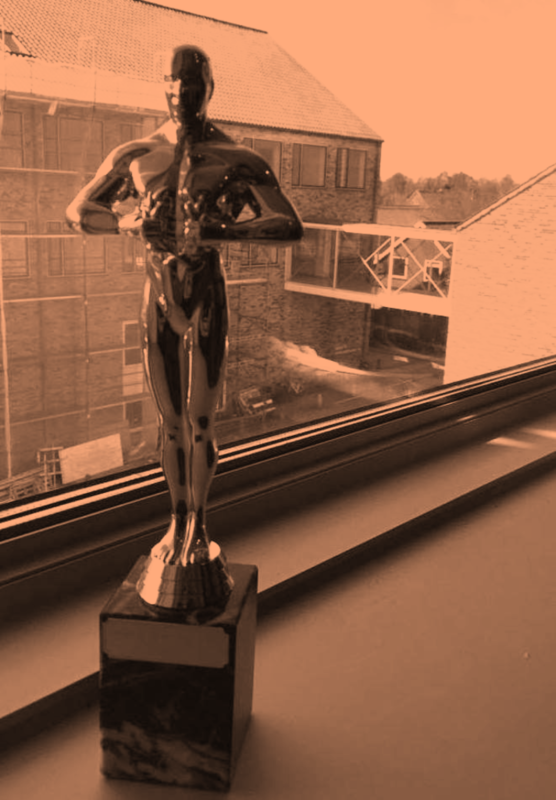 The Oscar Statuette aka Buddy Programme Trophy aka GHOST Trophy aka Legend of Oscar Trophy is the trophy given to the Buddy of the Year. The trophy will be given at the Christmas Dinner and will be followed by another special prize we will announce later in the programme.